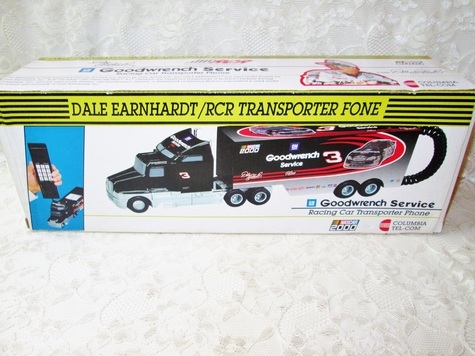 Dale Earnhardt RCR Transporter Novelty Phone collectible NIB never used in excellent new condition with all needed cords for hook up and use. Great collectible NASCAR gear for your home decor and for the Dale Earnhardt #3 fan. By Columbia Tel-com 1997 features GM Goodwrench Service Racing Team Markings & paint designs. FCC approved ETL approved, flash switch, last number redial, tone pulse switchable, fits any jack, complete with power cord. Truck is 14" long 4-1/2" tall. Phone handset is regular size.